quintessential French luscious dish but chicken is great. 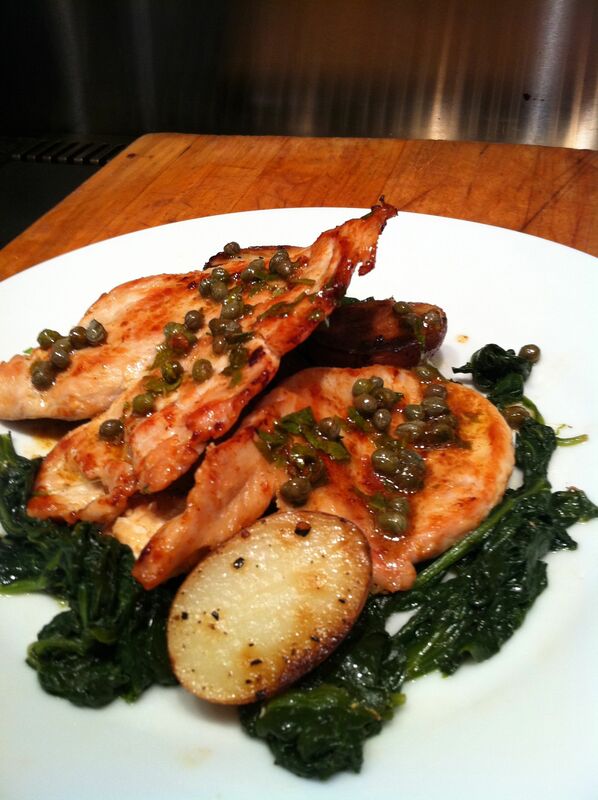 Here it’s served with spinach and roasted potatoes. 1. Wash the potatoes, dry them and cut them in half. about 4-7 minutes. Remove and hold warm. flattenwith a mallet to a Â¼” thickness. 2. Dredge the cutlets in the flour to very lightly coat them. Shake off excess flour and hold them. immediately if you see that the oil begins to smoke or burn). 5. Arrange the vegetables and the cutlets as shown on warm plates. skillet heat the butter on medium heat. rich, rustic food that makes you break into a genuine smile. I’m getting hungry!